UKAR prides itself on its critical eye, its independence and its honesty when reviewing aviation events. Others may ignore the faults in an airshow to publish only the positive. However when reviewing the 2011 Air Day at RNAS Yeovilton it is difficult to suggest any areas for improvement - considering today's airshow climate it was close to the complete airshow. 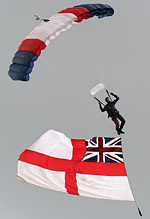 Trev Collins reports on the Royal Navy's showpiece event. Photos from Philip Jones, Trev, Russell & Neville Collins. 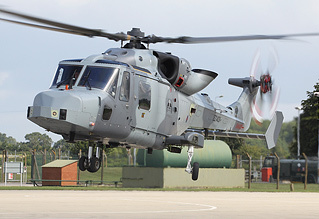 Yeovilton focused on 40 years of the Lynx, which has given sterling service over that period to both the Army Air Corps and obviously the Royal Navy. It is perhaps odd to think of the Lynx as forty years old, as it is still such a capable and adaptable mount. It is difficult to imagine that when Westland test pilot, Ron Gellatly, first took to the air in March 1971, he could conceive of his mount not only still in service in 2011, but also being reborn in the shape of the Lynx Wildcat forty years later. To mark this anniversary, there were various parts of the display dedicated to the type. 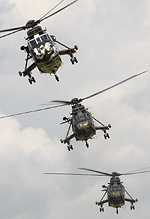 The show began with the impressive mass launch and flypast of no less than ten Lynx in total; nine of the venerable Navy machines joined by the new Wildcat. One could even be forgiven for humming Wagner's classic piece from Die Walküre. The Wildcat then swept in into its display. Although to the airshow viewer the Wildcat appears to fly much the same as earlier models, it looks strikingly different, boasting faceted undersides and beefier engine cowling. 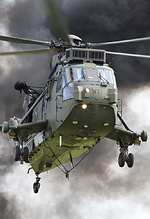 The Lynx was also evident in a rare Army display as well as with the Navy's always photogenic 'Black Cats' display team, and also got its own role demo featuring Royal Marines where six Lynx simultaneously performed different typical roles ranging from Search and Rescue to Gunship. This was all in addition to her role in the Commando Assault finale. Following the theme of Yeovilton as a 'complete' airshow there was much on show from heritage and vintage types, including the ever impressive 'muscle plane' of the warbird scene - the Sea Fury, whose spirited displays earn more admirers every time she flies. Undoubtedly highlights of the show were the displays of more classic aircraft in the form of the Vulcan XH558, and the Sea Vixen of DS Aviation. Although the Vulcan is now thankfully quite common on the UK display circuit, unfortunately, the same cannot be said of the Sea Vixen which has made far too few appearances on the UK airshow scene. What the public experienced at Yeovilton was indeed a rare treat; not only a full Sea Vixen display but also a fabulous series of formation flypasts with the Vulcan. Other major shows have in the past been criticised for not putting together such impressive and unique formations, however yet again we have another example of the Yeovilton organisers 'can do' outlook when these two classic jets were paired together. What Yeovilton offered the enthusiast in terms of modern military hardware was nothing short of outstanding. The Tornado Gr4 role domo, flown by XV(R) Squadron of the RAF, was described by a very amusing Scottish, yes that's right Scottish commentator, who offered "translation sheets in kiosks around the showground" to those who struggled to understand him. The demo itself was again an impressive insight into the work of the Tornado force; it should be regarded by the RAF as a real success this season. Also in the air display was the performance of the Belgian Air Contingent F-16, which although is still arguably the finest F-16 display in Europe, it seemed to lack a little of the aggression of last year's display. However the crowd were again treated to something unusual for a UK air display - the slightly inclement weather provided a contrasting backdrop for Michel 'Mitch' Beulen to fire off salvos of flares. The much discussed 'flares at airshows' issue is one that often sparks much debate on UKAR. It is without doubt superb for the photographer and was also part of the fine RNAF Apache display. There are different ideas of how fast-jets should be displayed at airshows. Some believe that the best displays feature the guile of high 'G' turns, loops and high alpha passes, others believe that the displays should feature fast low and close passes culminating in rapid climb outs. 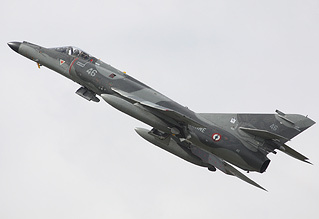 We have seen both at major airshows over the last few decades; however the French Navy display of the Super Etendard and Rafale strongly subscribed to the latter. To begin with the display featured several close formation passes but then morphed into one of the most exciting displays seen at a UK airshow in recent years, where both aircraft proceeded to 'beat up' the display line very fast and very low. Rumours that the Rafale had actually broken the sound barrier on one of the passes may be dismissed, but what was for certain was that the Rafale was not far off. The masquerade that this was in fact a role demo was pretty easy to see through, it seemed like an excuse for both pilots to go out and have a good time; for the crowd it was stunning. 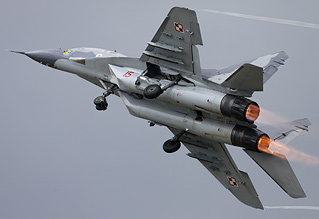 Displays of Eastern European aircraft are becoming less and less common in the UK which is why, when it transpired that the Polish Air Force would be displaying at Yeovilton, many enthusiasts were optimistic. When it was announced that they would be flying a MiG-29 that optimism turned to excitement. Although the MiG-29 offered us little that we had not seen before, in fact arguably less as the MiG's signature manoeuvre, the tail slide, was not included in the routine, it was still a coup on behalf of Yeovilton to get one. Most enthusiasts would list the MiG-29 as one of the highlights at any show this year. Yet again Yeovilton succeeds where others have failed. The MiG looked majestic, with a bright crest painted across the back of the aircraft, its huge bright orange afterburners and characteristic smoke pouring out of the twin Klimov turbofans, was indeed a sight to behold. The phrase "wouldn't be complete without…" is an often overused one; however it is difficult to imagine Yeovilton without the Commando Assault. This year's Commando assault was as impressive as ever - featuring Land Rovers, Royal Navy Hawks, Marine 'Junglie' Sea Kings, VIKING all terrain transports, Lynx, artillery pieces, lots of pyrotechnics and some fiendish bad guys! The Commando Assault is a breathless and extremely well coordinated twenty minute finale, fit to end any show. The kidnappers take hostages, the Royal Marines and their various assets fight back. It is wonderfully entertaining, and again, unique to this show. Yeovilton 2011: it's difficult to find a fault. One may say 'the static was very thin', perhaps, but the flying display was just so good it didn't seem to matter. Even normal gripes such as lack of showground toilets were managed well and there was little issue with traffic leaving the base as it was directed so well. It was quite simply, pound-for-pound, the best airshow I have attended for possibly a decade; a true champion.